During the holidays a lot of good eating habits go right out the window, both for kids and adults. With all of the parties, get-togethers and gifts of yummy (but not so healthy) food tempting us, it can be hard to stay on track. We all like to indulge a little, but it feels better to indulge without the guilt. YumEarth, the #1 organic candy company in the US, can help when it comes to indulging without feeling guilty, with their YumEarth Organics Gummy Bears for the holiday season. They are made with real fruit juice and other Earth-friendly and natural ingredients. They contain no artificial colors or flavors and no major allergens, such as gluten, nuts and dairy and no high-fructose corn syrup. Each serving provides 100% of daily vitamin C and has less than 70 calories. We received YumEarth Organics Gummy Bears to try and they really did get the "Yum" part of their name right! They are nicely soft and squishy and the fruit flavors (Pomegranate Pucker, Strawberry Smash and Sour Apple Tart) kind of pop out at you. I like that each bag comes with 10 cute little single serving pouches. They are the perfect size for stocking stuffers or holiday party goodie bags. They are also handy to stash in a purse or diaper bag as a healthier alternative when facing other treats. 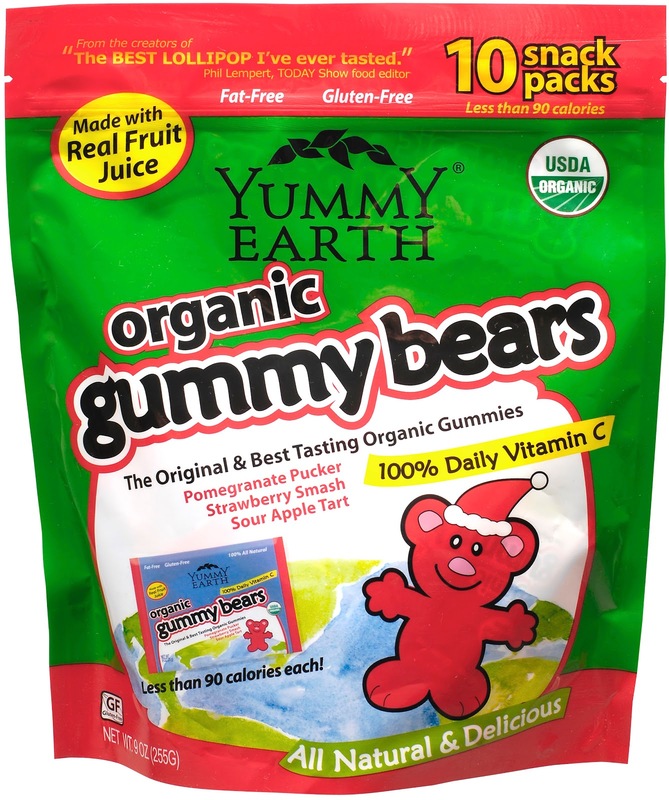 Reader Giveaway: One lucky Jinxy Knows Best reader will win a bag of YumEarth Organics Gummy Bears. To enter, just complete the entry form below by 11:59pm ET on 12/27/12. Good luck! a Rafflecopter giveaway Disclosure: I received product to facilitate this review. Any opinions expressed are my own. the sour beans are fun too! would be perfect for Easter baskets! The YumEarth Naturals Sour Beans 10 snack packs sound good. The Yum earth organcis Pomegranite look yummy.. The Anti-Oxifruits Drops look good. The sour worms look tasty! YumEarth Organic Lollipops look good! We already live the organic lollipops! The Roadside Root Beer Organic Candy Drops look good. The sour beans look yummy!